Home NEWS Pilots of Buggyra: Today was Real Hell on Earth! Pilots of Buggyra: Today was Real Hell on Earth! After the cancelled stage nine the crews returned to action again. 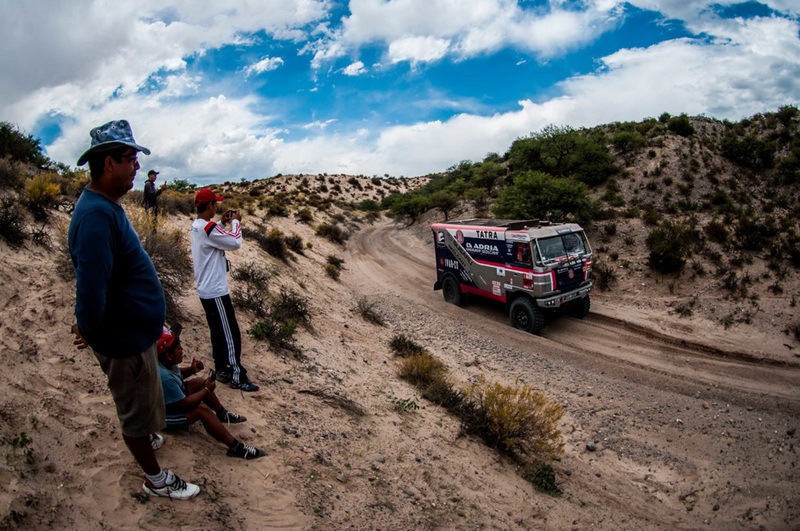 The organizers characterised the stage from Salta to Belen as the most difficult of the second half of Dakar Rally. Both pilots suffered the stage through. Despite that both Kolomý and Šoltys finally reached the top ten. “This edition shows that the organizers worked hard to make the race demanding and their route tests the technology in extreme conditions. Luckily, we have both trucks in the finish. Martin Šoltys drove excellently today again and got to the top ten. 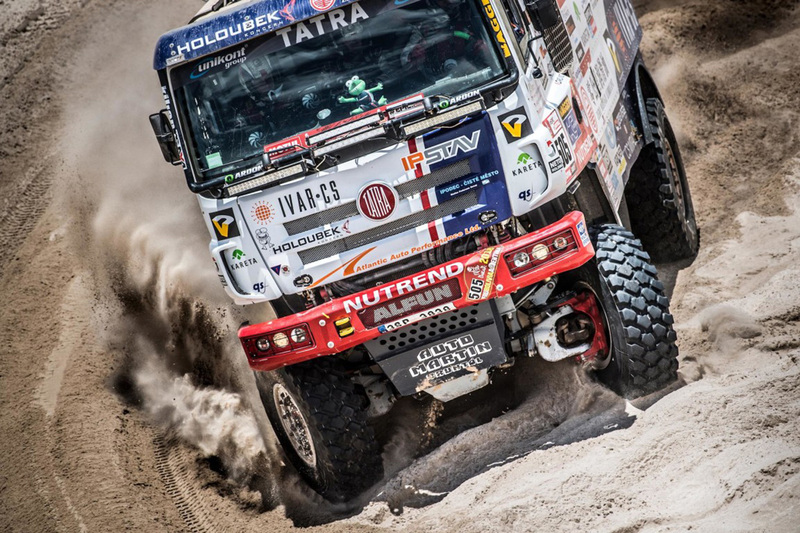 Martin Kolomý´s truck has prepared a lot of work to the mechanics, I think they will be busy till the morning,“ was Jan Kalivoda´s comment on the demanding race. Martin Šoltys ended with a rank in the top ten for a second time in this Dakar race, ranking ninth. It was the best result for Czech colours in stage ten. “Today´s stage was extremely long, we set off at eight in the morning and returned at ten in the evening. The first part was quite good the start of the second part was also nice, we drove through a river basin and the kilometres passed one after another. But then there was a section with kind of little dunes, about a metre high, so it was up and down, up and down, for about fifty kilometres. It was endless, and hurting. I asked myself what will endure that longer, whether the body or the truck. About six kilometres before the finish we broke a tyre, as a piece of bad luck, and we lost some time there. But we reached the finish after all, thank God,“ was the comment of Martin Šoltys on stage ten. For Martin Kolomý stage ten was a real purgatory, to use his own words. “Stage ten was real hell on the earth. After 40 kilometres we found ourselves lying on the side, then horrible bumps, the truck was tried up to its limits so much that I did not believe it could endure that. We were returned to our wheels firs by a Kamaz, but his rope broke and so I was finally returned to the race by a Maz. For the last 100 kilometres we had the rear axle broken so we only ran with front-wheel drive. I think it is written in my face today for this was a real purgatory,” described Kolomý the torture of stage ten. “I would never believe that dunes can be driven with the front wheel drive only. But we managed to get into the finish, so it is probably possible after all,“ smiled the surprised Kolomý, who moved to the thirteenth overall rank. The navigator Rostislav Plný lost his voice after the Tuesday´s stage. “Today was clearly the worst of the whole Dakar. Both for the demanding terrain and for the technical problems we had. My intercom broke in the course of the first kilometres and so I had to shout to be heard. 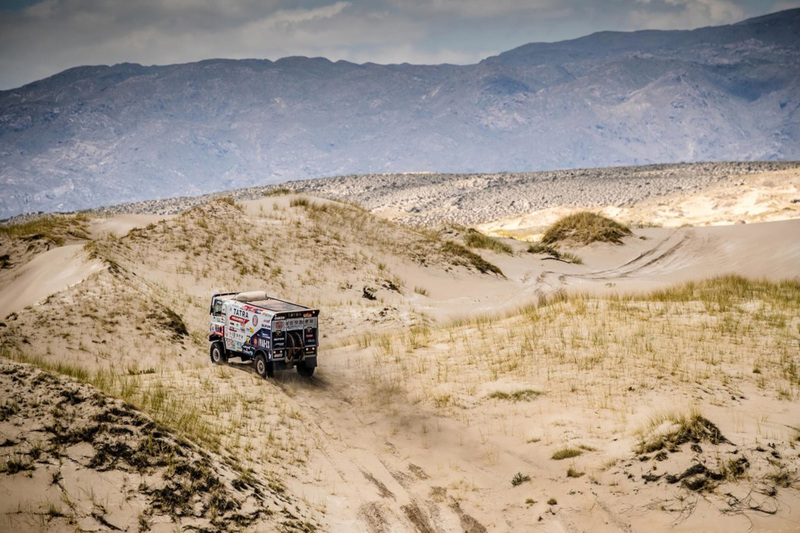 We fell on the side, lost rear wheel drive, accumulated some loss and reached the finish after dark, which was very demanding for navigation, for the waypoints could not be seen. Thank God we are in the finish, I have got enough today,“ said Rostislav Plný at the end of the demanding stage ten.